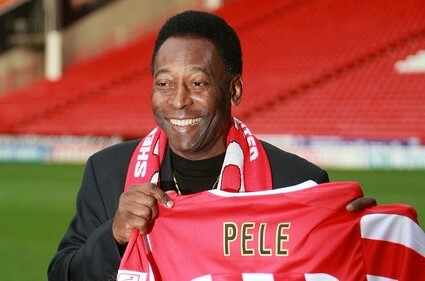 There’s only one Pele? Is there balls. As in Edison Arantes do Nascimento – the Pele. The Brazilian superstar-turned-corporate whore tops our list of Peles given that he is one of the greatest players to a kick a ball. Not a Pele by birth, but widely known by this name throughout his playing career. Abedi was born Ayew. Ghana’s greatest export was doing his thing for Marseille while Michael Essien was just a hyperactive five-year-old jumping into two-footed lunges on the streets of Accra. This Pele will be gracing the Premier League next season with West Brom. Portuguese by birth, Pele accepted he was never destined to star alongside Cristiano Ronaldo and has played for the Cape Verde Islands since 2006. The new Pele on the block. His real name is VÃ­tor Hugo Gomes PaÃ§os. He is 20 years old. He plays for Inter Milan. And he scores goals like this. Our first white Pele is a goalkeeper for Le Mans in France’s Ligue 1. The 25-year-old helped the club to promotion in 2005 and has remained the club’s number one ever since. Hot on the heels of little brother Yohann, is Stevie Pele (as he probably isn’t known). Symptomatic of being the elder brother, Steven obviously forced Yohann into nets as a kid. He is an outfield player – a defender for Guingamp to be more precise.